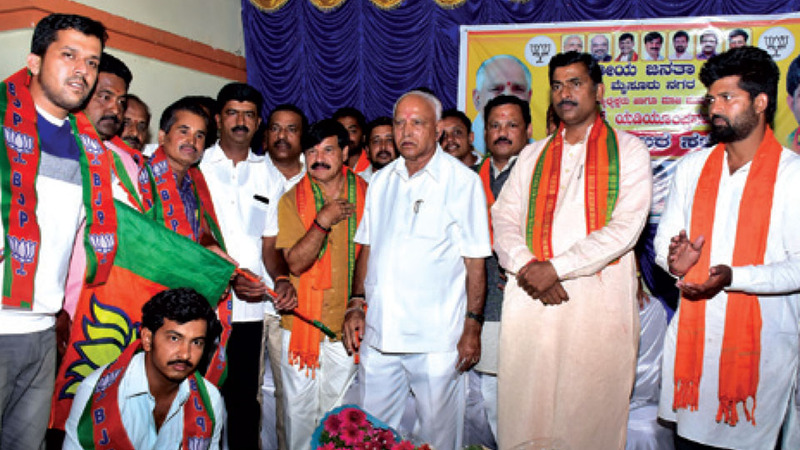 Mysuru: State BJP President and former CM B.S. Yeddyurappa (BSY) has said that the JD(S)-Congress Coalition Government will not last beyond the Lok Sabha polls. Speaking at a meeting of Party Pramukhs (leaders) organised by the city unit of the BJP at Aradhya Mahasabha in Chamundipuram here on Sunday, Yeddyurappa said he was thrilled on seeing the huge crowd at Prime Minister Narendra Modi’s rally at Maharaja’s College Grounds recently. Asserting that the BJP would win 300 plus seats in the LS polls, BSY said the State BJP was hopeful of winning 22 seats and one among them is Mysuru-Kodagu LS seat. Claiming that over 20 Congress Legislators would jump ship once the LS elections are over, BSY reiterated that the life of the Coalition Government would end with the 2019 polls. Accusing Chief Minister H.D. Kumaraswamy of running a ‘Tughlaq Durbar’, the State BJP Chief expressed concern over alleged JD(S) plans to spend Rs. 150 crore for winning Mandya LS seat, in which the CM’s son Nikhil is contesting on a JD(S) ticket as the coalition candidate. Alleging that the JD(S) was engaged in large scale poll malpractices to win in Hassan and Tumakuru as well, he said that the electorate will teach a bitter lesson to Coalition Government in the LS polls. On senior BJP leader V. Sreenivasa Prasad’s candidature from Chamarajanagar, BSY said that though Prasad was unwilling to contest, he chose to enter the fray following directions from the party High Command. Lashing out at the Congress for making attempts to divide Veerashaiva-Lingayat Community, Yeddyurappa asked the party workers to ensure victory of Pratap Simha in Mysuru-Kodagu and Sreenivasa Prasad in Chamarajanagar LS seats. Pointing out that his son Vijayendra has been campaigning extensively in Mysuru and Chamarajanagar, Yeddyurappa said the victory of his other son B.Y. Raghavendra from Shivamogga LS seat was certain as he had done good work as an MP. State BJP in-charge Muralidhar Rao, in his address, said that it was time for the electorate to decide whether they want a strong Prime Minister in Narendra Modi or a weak and corrupt leader from among the ‘Mahagathbandhan’ Opposition leaders. Emphasising on the need for re-electing Modi as the PM in the interests of the nation, Rao said that only Modi has the courage to fight enemy nations, while the Opposition leaders have a soft corner for countries promoting terrorism. Appealing the electorate to re-elect BJP Government at the Centre, he exhorted the party workers to work overtime for ensuring the victory of the party candidates. MP Pratap Simha, in his address, said that he had done his best for the overall development of Mysuru-Kodagu. Appealing the party workers to leave no chances for reaching out to the voters he urged the electorate to come out in large numbers on the polling day (Apr.18) and cast their valuable vote for the BJP. City BJP President Dr. B.H. Manjunath, Mysuru-Kodagu BJP in charge Dr. Vamanacharya, leader N.V. Phaneesh and others were present.